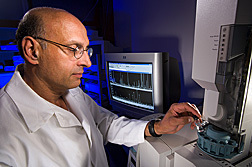 Molecular biologist Gautam Sarath loads vials containing hydrolyzed switchgrass cell-wall samples for analyses of lignin content by gas chromatography-mass spectrometry. 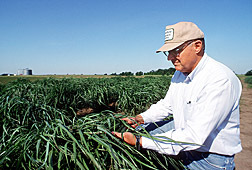 The data will be used to identify elite switchgrass plants for improvement through breeding. The perennial herb soapwort, Saponaria officinalis, owes its prized cleansing foam to detergent-like compounds called “saponins.” But soapwort isn’t the only plant that produces the compounds; nor are their properties limited to removing dirt and grime. 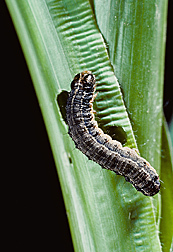 In studies at the Agricultural Research Service’s National Center for Agricultural Utilization Research (NCAUR) in Peoria, Illinois, scientists are spiking laboratory diets fed to corn earworm and fall armyworm with saponins from soybeans, switchgrass, yerba maté, and other sources to determine what effects the compounds have on the caterpillar pests’ growth and survival. ARS entomologist Pat Dowd says the studies are an integral part of a broader effort at Peoria to identify novel sources of resistance that can be put into corn—either through traditional plant breeding or biotechnological means. Ultimately, this could usher in new corn varieties that sustain less damage from caterpillars, are less prone to infection by toxin-making molds, or require fewer pesticide applications. 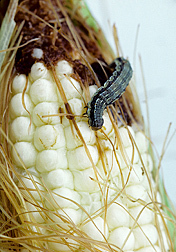 Another potential benefit is staving off the ability of pests like corn earworms to build tolerance to existing sources of resistance—such as that endowed by insecticidal proteins from the soil bacterium Bacillus thuringiensis, which is used in about 63 percent of U.S. corn, according to USDA’s Economic Research Service. “Looking for natural methods of controlling pathogens and pests is a win-win situation for the environment, for businesses who want to grow their efforts in green technologies, and ultimately for the U.S. taxpayer, who benefits from a cleaner environment and a thriving economy,” remarks Alejandro Rooney, who leads NCAUR’s Crop Bioprotection Research Unit, where Dowd, ARS molecular biologist Eric T. Johnson, and others are evaluating the insecticidal properties of saponins and other natural compounds. In nature, the saponins are produced in the stem, seed, roots, leaves, or fruit of plants belonging to more than 100 different families, including Allianceae, Caryophyllaceae, Rosaceae, and Gramineae (of which corn and switchgrass are both members). But until recently, no cross-cutting studies have been done comparing the degree to which saponins from different plant species or families confer resistance to pests and pathogens, note Dowd, Johnson, and colleagues in an upcoming issue of the Journal of Chemical Ecology. “Most grain crops, except for oats, do not have saponins in them,” Dowd says. Why this is so remains a mystery. But studying close relatives of today’s grain crops may reveal important clues. For example, examining saponins that make some types of switchgrass less palatable to fall armyworms may reveal dormant genes or biochemical pathways in a distant relative like corn that can be activated via genetic engineering or conventional breeding. A crucial first step in studying a compound is to determine its biological activity, structure, and expression levels. This past year, Dowd, Johnson, and ARS chemist Mark Berhow conducted experiments in which they force-fed 1 of 10 different kinds of saponins, caffeine, and other compounds to first-stage fall armyworms and corn earworms. The team purchased two of the saponins, a steroidal type called “diosgenin” and a related form called “protodioscin,” after being alerted to their presence in switchgrass by Ken Vogel at ARS’s Grain, Forage and Bioenergy Research Unit in Lincoln, Nebraska. Vogel’s team is interested in learning whether the saponins played a part in the resistance of some low-lignin lines of switchgrass to fall armyworms. The group had previously developed the low-lignin lines to expedite fermentation of the plants’ sugars into ethanol. One concern was that reducing the lignin content would also make the plants more vulnerable to chewing by fall armyworms. But in trials, 7 of the 14 switchgrass lines in fact resisted the caterpillar pests, though this depended on the timing of the growing season. “This suggests there is a temporal as well as a genetic component to expression of the fall armyworm resistance,” says Gautam Sarath, an ARS molecular biologist at Lincoln who is collaborating with Vogel and ARS agronomist Rob Mitchell to explore switchgrass’s potential as a commercial ethanol crop. Switchgrass can yield almost twice as much ethanol as corn, estimates geneticist Ken Vogel, who is conducting breeding and genetics research on switchgrass to improve its biomass yield and its ability to recycle carbon as a renewable energy crop. Sarath says it is possible that diosgenin, which has been linked to digestive problems in livestock, may have compensated for the reduced lignin by helping wreak similar havoc on fall armyworms that attempted to feed on the low-lignin lines during tests. In the lab tests at Peoria, protodioscin had some activity against fall armyworms, as did saponins from maté, soap bark tree, and soybeans. One type of soy saponin, called “soyasaponin B,” which has a sugar molecule attached, proved more effective than its sugar-free form against corn earworm caterpillars, reducing their growth by more than 50 percent. Dowd notes that they evaluated different sources of saponins because some insect pests, like fall armyworms and corn earworms, are generalist feeders, but still have different host preferences. Thus, it was expected that saponins the pests don’t typically encounter in nature would be more toxic to them. But this wasn’t necessarily the case. Rather, the difference seemed to come down to whether the saponins harbored certain sugar groups. None of the saponins tested killed either of the two pest species. But a smaller caterpillar isn’t necessarily a failure: Under field conditions, plants that taste bad can cause the caterpillars to seek out other plants; this could translate to reduced kernel damage as well as easier pickings for hungry predators. Besides saponins, the Peoria researchers are also evaluating the pest-fighting potential of phytochemicals such as anthocyanins, which give blueberries, plums, grapes, and flowers like petunias, for example, their blue and purple colors. In feeding experiments, corn earworm larvae forced to feed on blue areas of petunia petals gained less weight than larvae that fed on white areas. Additional feeding experiments determined that anthocyanins isolated from the petunia petals also slowed the larvae’s growth. Cabbage looper larvae that fed on blue areas of one petunia cultivar’s petals died at higher rates than larvae that fed on white areas. Although it’s unclear what petal compound or compounds were involved in looper mortality, the anthocyanins apparently increased the effectiveness of the toxic compound. If the proteins’ resistance role can be confirmed, then it may be possible to express the genes responsible for them at a later stage in the plant’s life cycle. “But this would be a matter of expressing them at sufficient levels,” Johnson adds. Berhow, who’s in NCAUR’s Functional Foods Research Unit, is pursuing another line of inquiry. Some of the same phytochemicals that plants make to cope with stress caused by insects and pathogens also benefit people and livestock. For example, studies by Berhow and University of Illinois (UoI) colleagues indicated that some soybean saponins have potential as cancer-fighting agents known as “chemoprotectants.” Indeed, in test-tube experiments, “group B” saponins reduced cancerous human colon cell growth by 27 to 68 percent. In addition to furnishing Dowd with purified material for the insect trials, Berhow has put his analytical chemistry skills to use assisting Elvira DeMejia, a UoI associate professor who is studying anti-inflammatory and other beneficial properties of saponins from yerba maté leaves, which are used to make a popular South American tea. Like other saponins tested, maté’s saponins also deterred caterpillar feeding. Ultimately, such multifaceted studies could converge, giving rise to new crop varieties that boast dual-use phytochemicals. In furtherance of that possibility, scientists are continuing research to understand the full biological activity and effect of saponins in humans and livestock.—By Jan Suszkiw, Agricultural Research Service Information Staff. This research is part of Food Safety (Animal and Plant Products) (#108) and Quality and Utilization of Agricultural Products (#306), two ARS national programs described at http://www.ars.usda.gov/research/programs.htm. To reach scientists featured in this article, contact Jan Suszkiw, USDA-ARS Information Staff, 5601 Sunnyside Ave., Beltsville, MD 20705-5129; (301) 504-1630. "Seeking Saponins and Other Compounds To Fortify Crops" was published in the August 2011 issue of Agricultural Research magazine.